The nylon spatula is made of high quality plastic and safe for all pans. Handles have ergonomic comfort and hole for convenient storage. 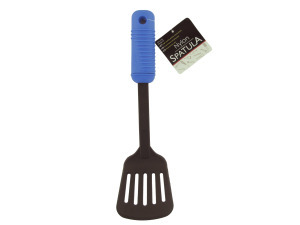 Spatula is black and blue. Comes packaged with a hang tag. Measures 11 3/4" long.